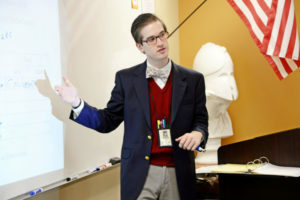 Students read a variety of classic works of literature including novels, speeches, and poetry. They continue to study grammar and writing expectations are increased. Through classic literature, students are exposed to models of virtue and are taught to search for truth, beauty, and goodness. It also requires high level of engagement of intellect, thus developing their intellectual virtues. These literary works require the students to think and encourage them to ponder, research, analyze, compare, struggle, consider, and draw conclusions. 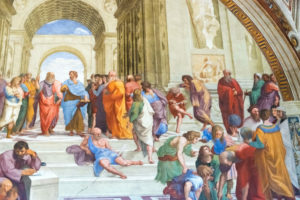 The Socratic discussions method greatly enhances their understanding of the novels and also prepares them for higher level conversations in the Harkness table discussion style in the School of Rhetoric. Similarly, in mathematics, the logic-phase student is expected to recognize relationships in numerical patterns, explain relationships (e.g., equivalences and probabilities) and to distinguish between the effectiveness of problem-solving strategies for various problems and contexts. Parnassus mathematics program is unique in that instead of units grouped around specific big ideas, our math program breaks apart these units and distributes the concepts throughout the year. The student is taught new concepts every day while also reviewing and practicing previously taught ideas. Cognitive scientists have shown that our brains need time to interact with mathematical concepts, as well as any knowledge, and to practice these concepts to achieve mastery, or automaticity, in the different areas taught. Our math program perfectly aligns with this philosophy of how our brains learn. The Logic phase involves ordering facts into organized statements and arguments. During the middle school years, students are beginning to think independently. They often develop a propensity for argument. Parnassus classical education teaches students in this phase to argue well. The study of formal logic helps students understand the fundamentals of a good argument. Practice in making written and oral arguments helps to further develop these skills. Teachers encourage the use of argumentation in each subject. In history, the chronological development of world civilizations is linked with a study of geographic regions, as well as introductory concepts of civics and economics. 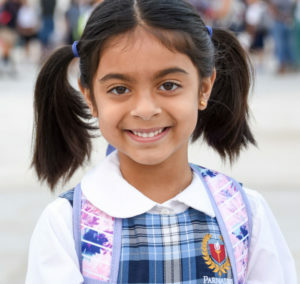 Beginning in 1L (5th Grade), scholars progress through the historical periods from the ancients, medieval in 2L, renaissance in 3L, and modern in 4L. 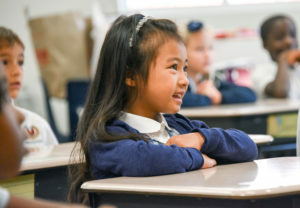 This method provides a narrative and sequence of interconnected events from the ancient times to today, helping the students better understand the progress of history. As the students have already studied these periods in the School of Grammar, their Socratic discussions can now go deeper and wider in each topic. In science, students learn about the natural world as well as the stages of scientific inquiry. We advocate for scientific learning and inquiry along with the Association for the Advancement of Science as stated in their 1993 report asserting that “…students should be actively engaged in learning to view the world scientifically. That means encouraging them to ask questions about nature and to seek answers, collect things, count and measure things, make qualitative observations, organize collections and observations, discuss findings, etc.” At Parnassus, topics in science are presented systematically, and clearly ensuring our students can make steady progress in their scientific learning. 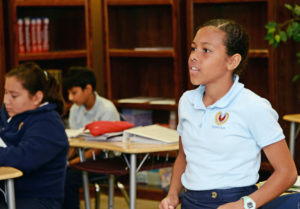 Students continue their studies in Spanish and Latin on a daily basis. Emphasis continues to be placed in learning vocabulary, verbs, verb tenses, and grammar. Parnassus leverages the teaching of Latin (and Spanish) to impart in the students a solid understanding of the English grammar. Beyond the benefits of increasing English vocabulary, studying Latin grammar is the best and easiest way to learn English grammar. There are many reasons for this, but one reason is that by the time students begin to learn English grammar, they have already been speaking and writing it without much analysis of the language structure. 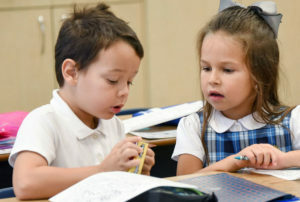 The unfamiliarity of Latin, a very structured and inflected language, forces the young scholars to evaluate every word and think carefully at every step about constructing sentences. Additional information about the benefits of studying Latin can be found on “Why Study Latin and Greek“? Similarly to the other disciplines taught at Parnassus, our Physical Education program is unique. It encompass physical activities and taekwondo building not only physical strength, agility, and flexibility, but also character development, collaboration, team work, and leadership skills. Students have the option to study art, chorus, band, or orchestra. Regardless of their choice, their studies will include the study of history. In visual art, scholars will also learn about art history including ancient, medieval, renaissance, and modern art and artists. In music, they will learn about the history of music and key composers through the ages. Art and music do not occur in a vacuum and thus are taught as part of the social fabric of the period being studied. Conversely, the study of these art forms is the foundation in the study of history. The arts are a reflection of the cultural, political, and philosophical circumstances of the time. Scholars at Parnassus learn to appreciate and critique the arts as well as work on their own art productions and musical performances.